Making glass at the Corning Museum of Glass in upstate New York. The Waxomatic Records Voice-O-Graph looks like something in a museum: a throwback to pre-digital times when aspiring musicians and lonely lovers would record themselves on vinyl in pursuit of different but equally passionate desires. But this one, assembled in 1947, still works — the last of its kind, according to Jess Rice, a transplant from Medway who’s among the hipsters tending it. It’s a centerpiece of the converted auto-body shop behind the Nashville Mission in the city’s fashionably seedy Pie Town district that houses Third Man Records, a label founded by Jack White of the White Stripes. And visitors are welcome, for $20, to squeeze inside and make a record they can take home as a very personal reminder of their trip to Music City. This idea appears to be so appealing that it’s not only tourists who are recording in the soundproofed booth, with its chrome art-deco finishings, that anchors the label’s hip gift shop. Neil Young, Loretta Lynn, Jay Z, Pearl Jam, and Willie Nelson have, too. Across town, at Nashville’s famous Goo Goo Clusters — purportedly the world’s first combination candy, invented in 1912 — visitors can make and take home their own versions of the amalgamation of marshmallow nougat, caramel, roasted peanuts, and milk chocolate. Then they can pull up a seat at the Candle Bar at Paddywax and pour their own keepsake candles. A short walk from there, they can create their own letterpress posters at Hatch Show Print, which has turned out some of the most iconic country music posters. It’s not just in Nashville that this is happening. Destinations worldwide, and tour operators that serve them, are responding to a growing demand from travelers who want to not just see, but do. 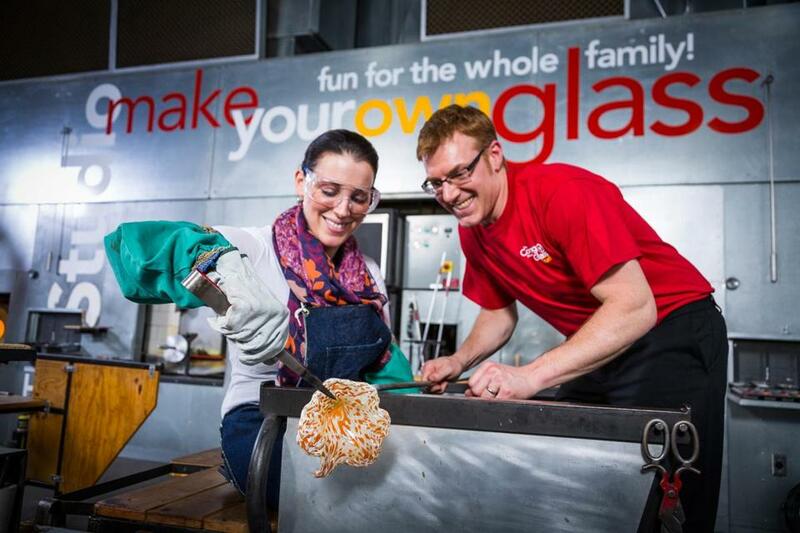 “What we’ve learned and what we hear every day from our guests is that that immersive experience resonates more strongly, because there’s a visceral connection with the place you’ve just been,” said Ann Campbell, marketing manager at the Corning Museum of Glass in upstate New York, which offers glass-blowing lessons for visitors who get to take home their creations as mementos of their visit. Nearly a third of the museum’s guests do this, even though there’s an extra charge of as much as $48. Not far from the museum, in New York’s Finger Lakes region, Glenora Wine Cellars offers “make-your-own-bubbles” classes from which visitors can leave with their own bottles of champagne after donning aprons and learning from a winemaker how to filter out the yeast and sweeten the finished product. People who prefer something stiffer can head to Buffalo Trace, a bourbon distillery in Lexington, Ky., where they get lunch, a tour, and hands-on training in how to pick their own barrel of bourbon, which is then hand-bottled for them. That’s a pricey souvenir — barrels start at $5,500 — but the experience has grown so popular amid an ongoing whiskey craze, it has to be scheduled as much as a year in advance. Travelers can also make pottery and Celtic jewelry on Tauck’s “Ireland Forever” package and jewelry or art from sea glass or their own Mi’kmaq moosehide drum on Prince Edward Island or Mi’kmaqnest baskets in New Brunswick. At M.L. Leddy’s in Fort Worth, Texas, they can be fitted for custom-made cowboy hats, boots, or belts. Hawaii’s Surfjack Hotel & Swim Club offers lei-making lessons; the Grand Hyatt Baha Mar in the Bahamas, classes in painting, ceramics, culture, and arts and crafts that guests can carry home. Companies including Perillo’s Learning Journeys are all about experiences like these. One Perillo trip to Japan includes Saori-weaving demonstrations, which end with travelers crafting their own small scarves or shawls. On the “Italian Art and Architecture” tour, customers learn to make mosaic tiles using as their models products from a local food and farmer’s market; on trips to India, they can sit with local women and quilt. One that’s being made available in destinations of all kinds. Alaia, a new resort in Ambergris Caye, Belize, for instance, will include a working art gallery just off the four-story atrium when it opens around Christmas 2020, developer Andrew Ashcroft said. Local weavers, woodworkers, and potterymakers will be there every day, making custom handicrafts for guests to take home or showing them how to create such things themselves. “Belize in general is very culturally rich place, and when you come here and you just sit on the beach you miss that whole element,” said Ashcroft. Jon Marcus can be reached at jonmarcusboston@gmail.com.